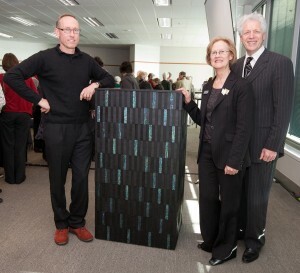 To celebrate Te Papa’s tenth anniversary, the Friends of Te Papa commissioned artist Humphrey Ikin to create a lectern for Rongomaraeroa, Te Papa’s contemporary meeting house on Level 4. Humphrey Ikin, Friends of Te Papa President, Sally Munro and Te Papa's Chief Executive, Dr Seddon Bennington, at the gifting ceremony, 25 June 2009. © Te Papa, 2009. 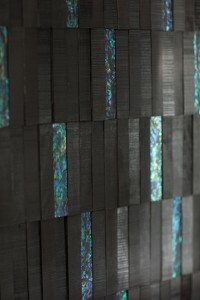 Humphrey Ikin is an artist working in wood already represented in Te Papa’s collection. ‘Red Stave Chair’ is currently on display in the Eyelights Gallery on Level 4. Lectern detail. © Te Papa, 2009. The lectern represents a cloak of feathers of that vocal and resilient bird of the bush and city, the tui, and will be lit from within. Humphrey Ikin said this of the concept for the lectern. The lectern will be used during events and ceremonies on the Marae and throughout the museum.